And it has a giant pompom! I love the colors, and I loved working with the Swans Island yarn (such a treat! 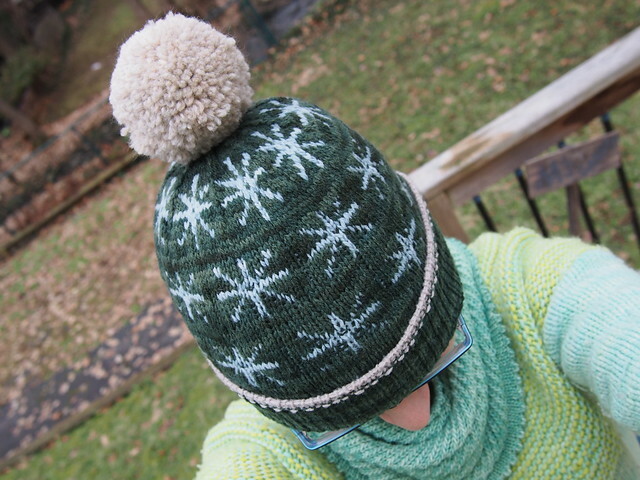 ), but I’m not sure how much I loved knitting the pattern – the super thin lines of the motif combined with extremely long spaces between contrast color stitches meant doing a lot of float-catching and managing. 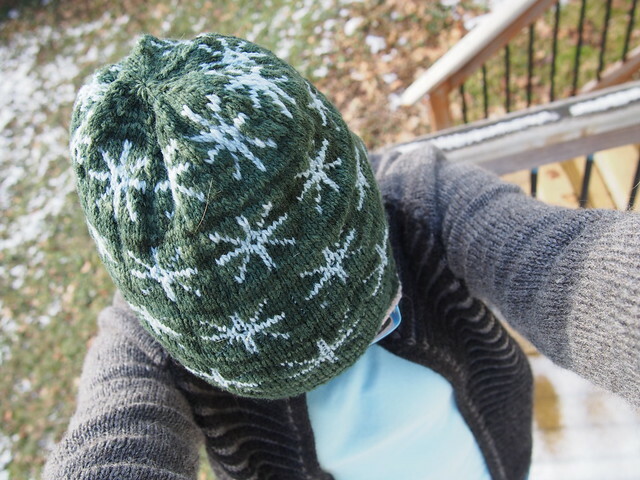 And even though I hit gauge perfectly and I don’t think I have a particularly large noggin, the hat came out pretty darned tight, and that strains the floats and ends up making some of the diagonal lines of the asterisks disappear a bit. 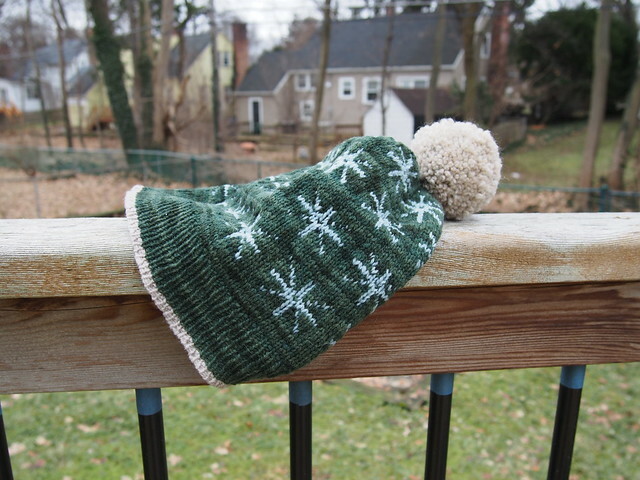 I also end up having to fold up the brim to make the hat not all floppy in the back, and if I’d known that ahead of time, I might have handled the color change on the bottom ribbing differently. Oh well! The colors really do match my eyes ever so well, don’t they? 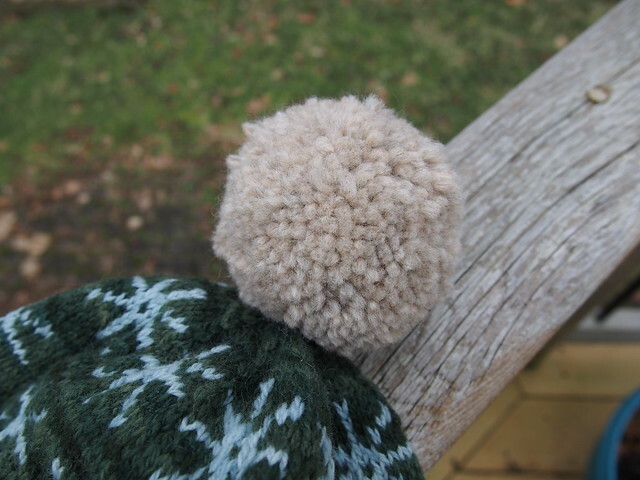 I was really pleased with how squishy and delightful my pompom turned out. 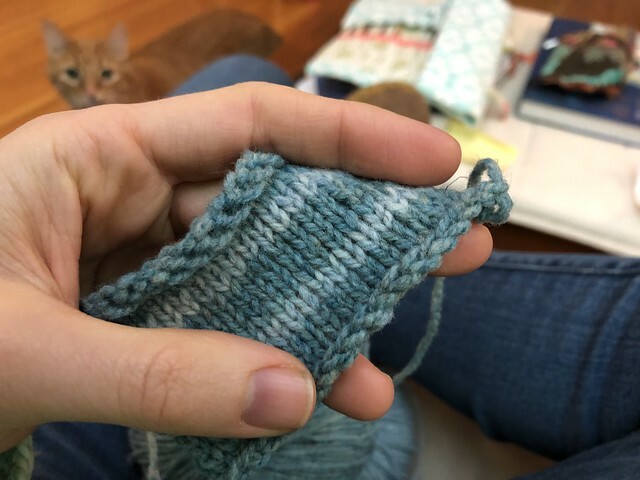 I used some of the leftover Patons Classic Merino that I have from the matching sweaters I made for me and M, which matched the “Beach” colorway of the Swans Island yarn almost perfectly, and it came out very full and fuzzy! 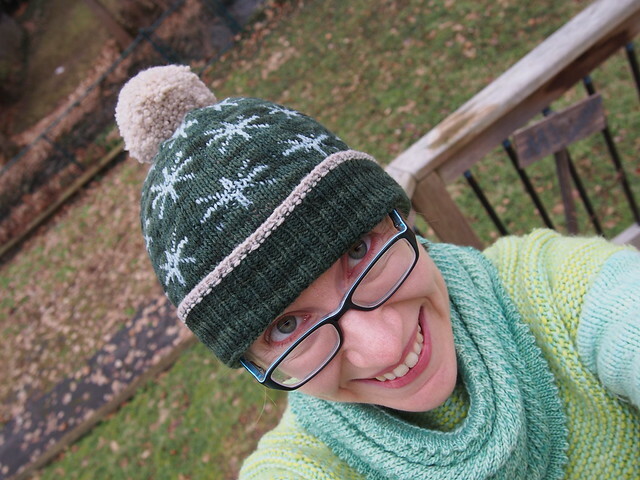 It turns out to be very hard to get a picture of your own head wearing a hat with a giant pompom! Also hard: getting used to HAVING a giant pompom on your head when you’ve never worn a hat with one before. I kept getting distracted by the feeling of it bobbing on my head, and when I was wearing it in our house, I kept bumping it into things! 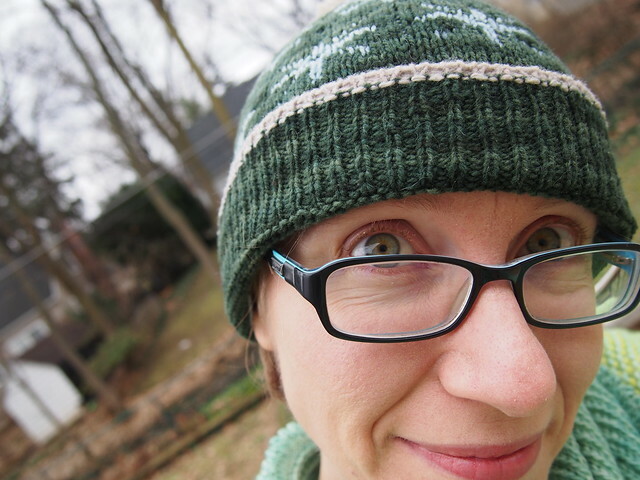 Anyway, I’m pretty happy with my new hat! 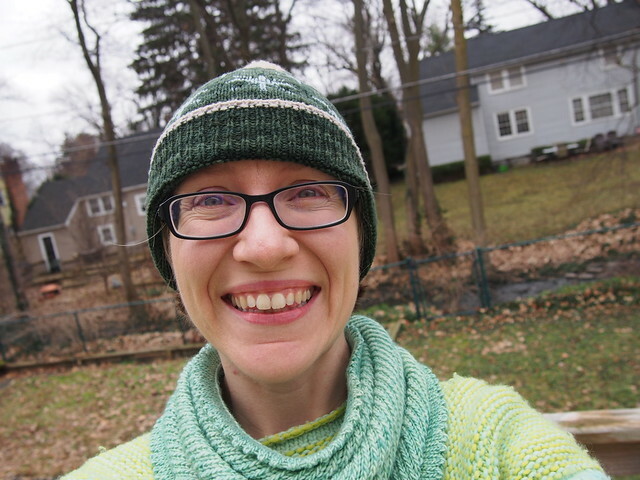 I’m less sure about what to do with the leftover yarn in the kit, though – the kit I got had enough to knit the hat and a matching cowl, but I don’t think I want to knit the Asterisk pattern again because of the ultra-long floats, and the “Dot” pattern doesn’t look much better on that front. But I definitely want to knit with the Swans Island yarn again, because it was utterly delightful! Perhaps I’ll design something myself using these colors. That’s De Rerum Natura Ulysse in Lagon and Ciel, and I’m plotting a me-sized version of the Striped Pocket Pullover that I knit for M a few years ago. Wish me luck! Finally Finished: Me-sized Elle Melle! Happy that you are posting more frequently. I enjoy your projects and progress on them. I was visiting every few months – just got back and bam! 5 or so new articles! What a treat! Are you going to make a willow cowl out of the leftovers?